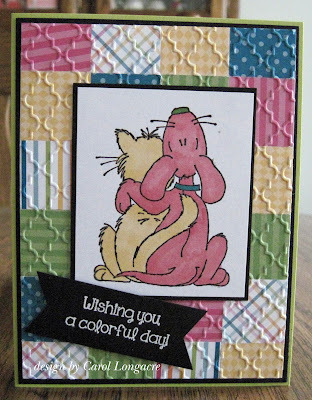 Just a fun card to share with you today using bits of MFT dsp. I cut 1" squares and glued them to a card stock panel, then embossed it all with a CB decorative tiles ef. I stamped the Inky Antics image, and colored the cat and dog with odd colors to go with the theme of having a colorful day. The SNSS sentiment was heat-embossed with white ep on black and fussy cut. Have a colorful day and enjoy it whatever you do! Very colorful, the saying goes perfectly with your card. Have a great weekend! A super card Carol, such a cute image and fabulous background. What a fun card! Yes, I need to CASE it, at least the background. Thanks for sharing. I too love both dogs and cats! Brilliant card, Carol, the patchwork with the embossing is so effective. Cute image, great sentiment and a super way of using snippets. This is wonderful, love the image and the patchwork. I have a box of all !' squares... Now I see what to do with it! Adorable inspiration! Unusual colors but it sure looks great! I really need to use up my scraps and make some backgrounds like you do. Your backgrounds are always so amazing. I love it! !